oatmeal lace design: friday favorites. 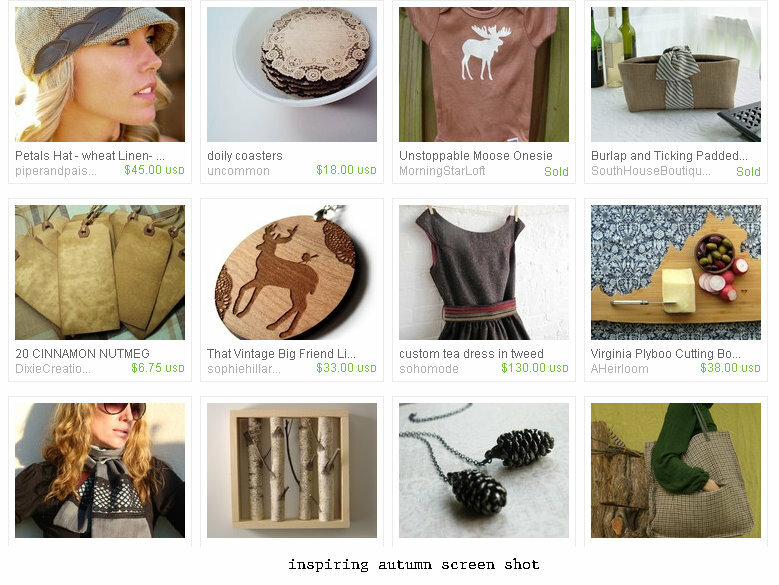 Inspired by my fall favorites post (maybe even including a few of them...) I took a stab at creating my first Etsy Treasury, aptly entitled 'Inspiring Autumn'. I'm using that board for my Friday Favorites post. The picture above is a screen shot of the page, but you can see the whole thing here. I mentioned on my facebook page that I would seriously be thrilled to have any item on this list (Christmas is just around the corner folks!) and there are lots of different price points too- so it's not like I'm being a Greedy McGreederson over here. People are always asking 'What would you like for Christmas? and my typical answer is 'I don't know. Money?' Always good, but oh so boring to open. Regardless, I think there are a lot of items on here that make great gifts, so check it out. 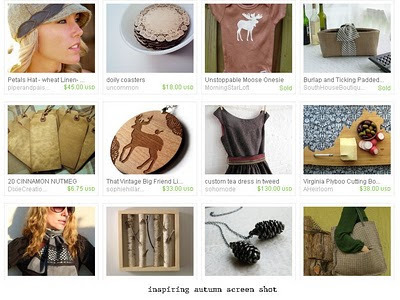 As a matter of fact, treasuries on Etsy are a great way to find something for the hard to shop for person in your life. Type in a couple of key words that describe items/colors/etc they might like and voila- you might stumble across something fabulous. Try it out for yourself here! I really can't say enough good things about Etsy. I did a majority of my wedding shopping on the site and could not be happier with the customer service and products received. Also- don't forget to head over to Emmaline Bride and enter to win a custom clutch made by yours truly. If you are one of my dear, dear readers I would really love to make a bag for you!!! Hope you all have a very Happy Halloween!! !